This summer I interned at MATV, and was a counselor for MATV’s Multi-Media Madness two week program in mid-July. My job was to photograph and document the class as I, and the kids, experienced it. 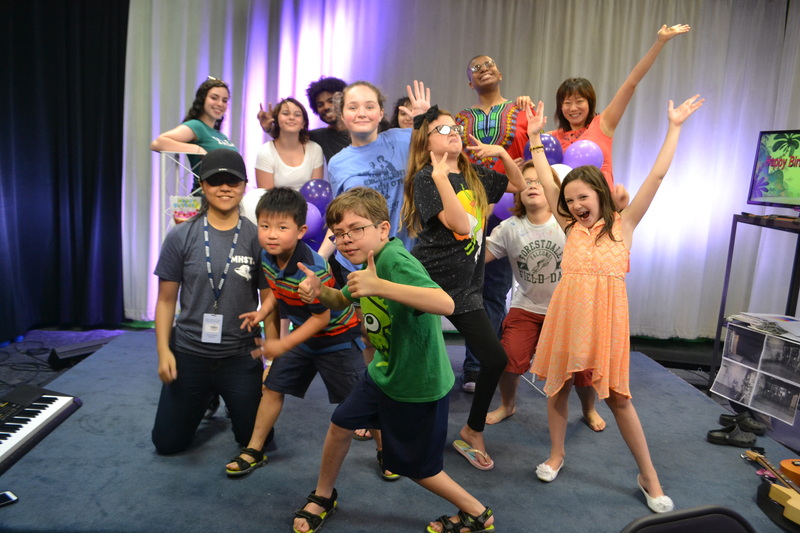 This year’s workshop centered on teaching kids how to write, direct, and record their own music videos, shows, and stories in MATV’s studios. They then edited them on the computer and presented them to the rest of the class. The kids, ranging in age from 8 to 13, spent the first few days of the program brainstorming and figuring out what they wanted their individual projects to look like. Thanks to MATV’s extensive costume storage, and guest instructor Masio Dotson’s guidance, inspiration was not difficult to find, and soon everyone had come up with a thought-out idea. The Multi Media Madness summer class at MATV. Author of this article, Delilah Doeleman, is in the far left corner. Others, clockwise, are Matilda Turck, Masio Dotson (instructor), Shannon Bellofatto, Vanessa Ardai (hidden in far back), Amici Egbunike (teen assistant), Hailey Hao (MATV Educational Access Coordinator), Abigail Wightman (far right in front), Nico Sedan, Lily McDonough, Finn Sedan (front center), Daniel Luo and Malisha Zhou (teen assistant). Among some of the more “out of the box” ideas were a My Chemical Romance music video, brought to life by Finn, one of the program participants, and his friends whom he cast as his bandmates (he was the lead singer, of course). With blasting the angsty, intense song over and over in the studio to get all the right takes and scenes, and hearing the kids rock along to it as if they were on a stage in front of thousands made this project a collective favorite. The girls’ parody of the popular reality TV show, Keeping Up With the Kardashians, was particularly fun to record and direct with all of the colorful sets constructed from chairs and fabrics found in MATV’s basement. The phrase “Kylie Jenner to the foyer, I have a little surprise for you!” quickly became the motto of the program after filming these scenes. Instructor Masio helped the kids sift through some of their more complex ideas, and the class spent a long time before actually choosing their final ideas thinking about their characters, and what they wanted their project to convey to their audience. Matilda, another participant in the program was immediately drawn to the idea of a more subtle and meaningful piece that focused on heartbreak, and the feelings of complete devastation when you lose someone you love. Her idea was to have scenes of both happier and darker times to showcase the perspective “befores” and “afters” of her main character’s heartbreak. Of course not all of the time was spent recording, editing was hugely important in creating a finished piece. The kids used Final Cut Pro, a computer program in MATV’s editing suites to cut different scenes together, and add sounds and effects. On the second to last day, Masio held an editing competition in which partners were assigned one of the projects that the kids had completed, and tasked with editing them in a different way than the original piece in order to convey perhaps a different message, or to simply add anything they thought the project might be missing. In between the recording and editing, the class also had “music days” on Thursdays, in which everyone would bring in an instrument (we had kids bring keyboards, ukuleles, guitars…) and hang out in the studio jamming out and teaching each other how to play different songs and chords. Some intense games of musical chairs were not uncommon. All in all, these two weeks were filled with important ideas, hard work, and a whole lot of heart. It was easy to tell how much all of these kids cared about their projects and about having their voices heard. No one, least of all I, should be surprised when all of them make it big, but hopefully they’ll all come back and visit us at MATV where it all started. Article and all photos by Delilah Doeleman, a student at Malden High School. What a delightful accounting of a priceless experience. Delilah, would you share this with the Blue & Gold? It would be a wonderful contribution for the first fall edition. It is inspirational. Mr. Lombardi is an experienced journalist. Let’s get a studio in MHS!! !